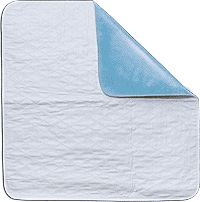 ReliaMed 18" x 18" Reusable Wheelchair Pad, Ibex Quilted. Non-slip, waterproof, PVC backing. Moderate absorbency 8 oz. soaker. Machine washable. Comes packed in a clear retail package.